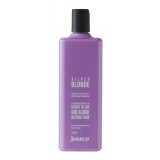 Micro blue violet colour pigments penetrate deeper into the hair shaft dramatically reducing gold and yellow tones in all blonde, bleached and highlighted hair. 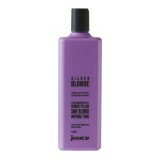 Juuce Silver Blonde helps maintain a cool or neutral tone while protecting and moisturising blond..
Juuce Silver Blonde helps maintain a cool or neutral tone while protecting and moisturising b..
Juuce Silver Blonde Conditioner helps maintain a cool or neutral tone while protecting and moistu..
Juuce Silver Blonde Conditioner helps maintain a cool or neutral tone while protecting and mo.. TREATMENT Revives very dry/damaged blonde hair with shea butter repairing and ..
Juuce Majik Blonde Lok 30mL BLONDE-LOK Instant 30 second double action repair ..